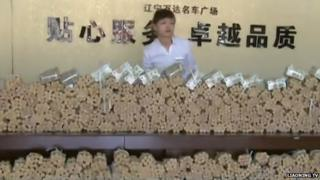 A Chinese man has paid for his new car using 660,000 coins and 20,000 low value banknotes, it's reported. The buyer, identified as Mr Gan, handed over the huge haul of small change to a dealership in the northeast city of Shenyang, the Liaoshen Evening News reports. Each coin and note was worth just one yuan ($0.16; 10p), and the hefty sum, weighing four tonnes in total, took up more than 4m (13ft) of floor space within the showroom, the report says. Mr Gan explains that he paid in cash because he had amassed a huge amount of small denomination coins and notes through the petrol station where he works. "As our station is in the suburbs, there are very few banks. So we didn't deposit the coins and decided to use them to buy a car for our company," he says. The buyer warned staff at the car dealership in advance about his unusual payment method, and the cash was neatly wrapped in small packages. But it still posed a logistical challenge - employees needed more than an hour to move all the cash into the showroom. They then had the unenviable task of gathering it all up again and taking it to the bank.